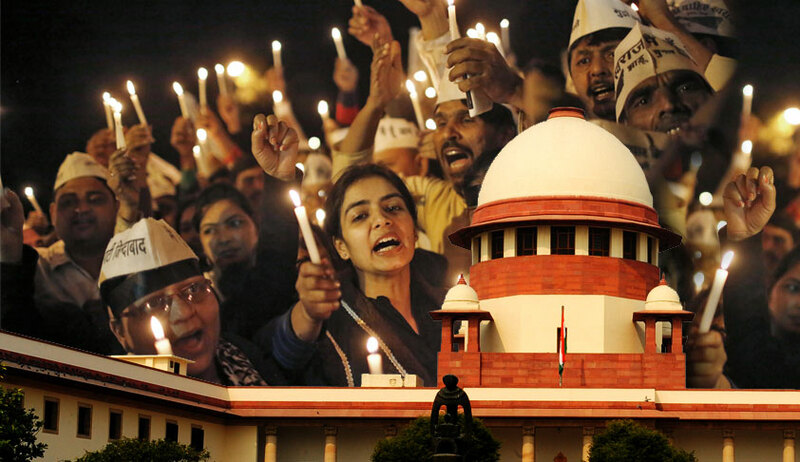 A Three-Judge Bench of Chief Justice Dipak Misra and Justices R Banumati and Ashok Bhushan has dismissed the review petitions filed by death row convicts in the 2012 Nirbhaya gangrape case and upheld the death penalty awarded to them. "there is no error apparent upon the face of the record", said the bench. Sitting in appeal, the Supreme Court had in May, 2017 refused to attach any weight to the defence objections of delay in filing of FIR, non-mentioning of assailants’ names in the FIR, credibility of the testimony of the informant or the alleged tampering of the CCTV footage. The submission regarding non-compliance with the provisions of sections 235(2) and 354(3) of Cr. P. C. also had not influenced the judgment. The review petition filed on behalf of convict Mukesh Kumar, challenging the impugned judgment on the ground that the aforesaid convict is falsely implicated and that he was not present at the crime scene at the time of the unfortunate incident on 16th December 2012. Finally, Mr. Luthra submitted that the initial arrest was made at Delhi and not Karoli, Rajasthan as contended by Mr. Sharma and that within 24 hours of the arrest, Mukesh had been produced before a magistrate. The Investigating Officer, in the preliminary enquiry, had recorded two sets of articles obtained from two places which were confirmed, firstly, by disclosure and subsequently, under-recovery for the purpose of section 27 of the Indian Evidence Act of 1872.